Besides understanding the proof of the fundamental theorem of geometric group theory, figuring out how to classify the homeomorphisms of the torus is one of the first exercises grad students in my field do. It involves lots of matrix multiplication and remembering some facts from linear algebra, which we’ll sorta brush over (mostly because I don’t remember anything from my linear algebra class besides that Stephen Goode always said bee-ta and once told us that if we left his class saying bee-ta then we’ll have learned something. I’d never heard it before so I had no idea what he was talking about until a few years later when I said bee-ta and everyone was like uh you’re not European/Australian… Long story short, Americans say bay-ta for ). Visualizing abstractions is one of the hardest skills in math (I think so anyway) but once you’ve started it, it’s difficult to remember that people don’t look at flat squares and see donuts right away. So hopefully this helped you! 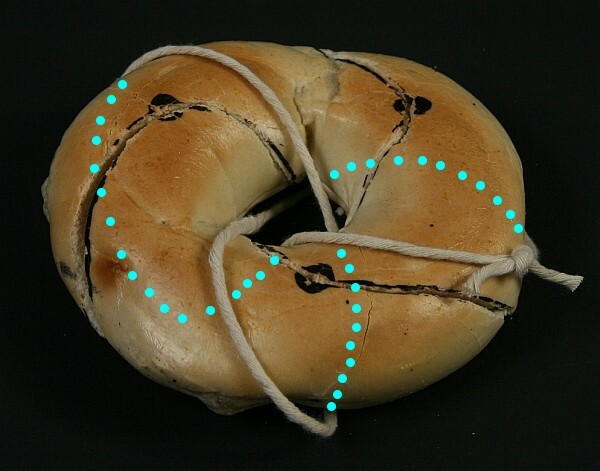 Taken from George Hart’s brilliant bagel page: the string shows part of the curve, and the dotted lines show where the string continues on the back side. Or I can use math to describe it. Notice that the string goes through the hole 3 times (easy to see) and around the hole twice (a little harder to see). So it goes around the skinny side (the longitude) three times and around the flatter side (the latitude) two times. Let’s name this the (3,2)-torus knot. Just like with the curve complex, we don’t care if we wiggle the string a little bit (isotopy). There’s another cool thing we can do with a square: tile the plane! Left: follow the numbers to see the knot. Right: look at the bottom-most green line. It might take a little while to understand this picture. On the left, start in the lower left corner. Follow strand 1 and you hit a point about 1/3 the way down the right side. Since the blue arrows are identified, this is the same as the point about 1/3 the way down the left side, which means we go to strand 2. Similarly, the middle of the top and middle of the bottom are identified, so we get to strand 3, and finally strand 4 finishes the loop. Instead of doing that tracing, we could draw the (3,2)-knot on the tiled plane, so that it goes over 3 times and up 2 times. 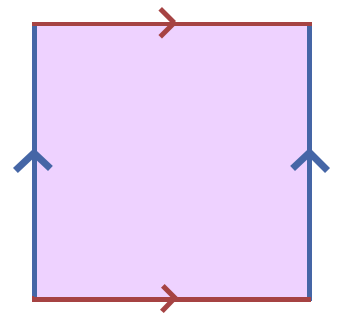 So we can see this loop as a line with slope 2/3 in the plane, which is way easier to draw than the picture on the left. I added in all the lines on the right to show how the left and right pictures are related. 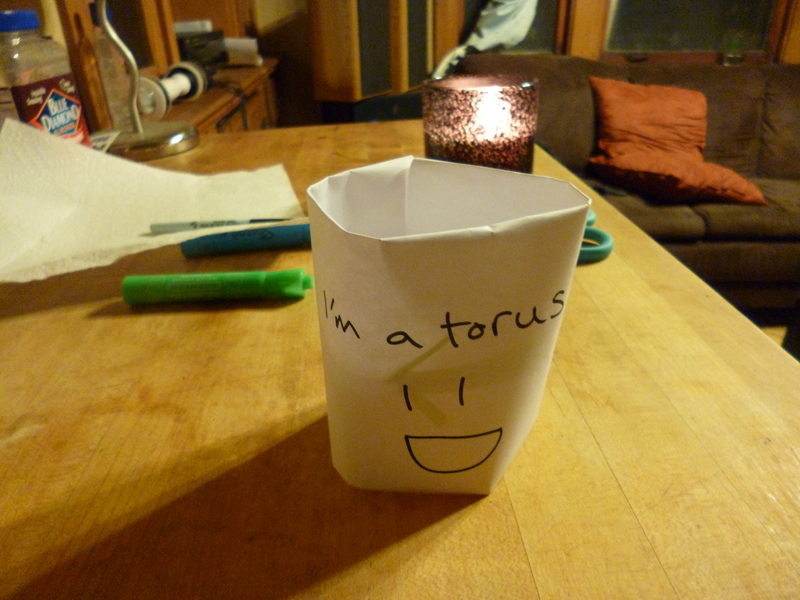 To summarize so far: a torus is a donut, and we can think of it as embedded in real space (an actual donut) or more abstractly as a square with the sides identified. The plus of the flat picture is that it’s easier to draw, and it can tile the plane, which led to us associating loops of the torus with lines of fractional slope in the plane, just like our bagel loop was the line with slope 2/3. OK, onto the homeomorphisms part. 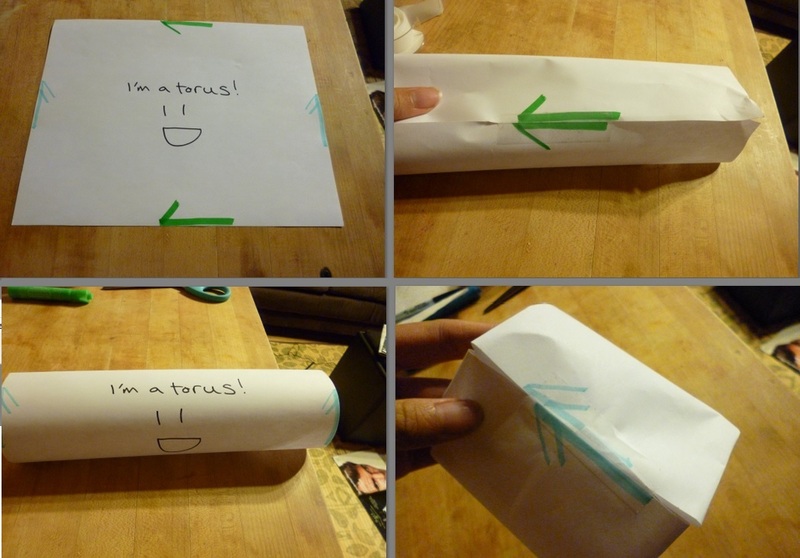 A morphism is a map that assigns points in $X$ to points in $Y$. For instance, the yellow pages describe a morphism from X=People to Y=Addresses. Yes, I did just refer to the yellow pages. No, I don’t know if they still exist. Deal with it. A homeomorphism, then, is a special kind of morphism. It goes from one topological object back to itself, so Y=X, and it has an inverse. In our example, there’s no inverse because if I give you an address, you might give me five people back, while if you give me a person, I’ll give you just one person back. 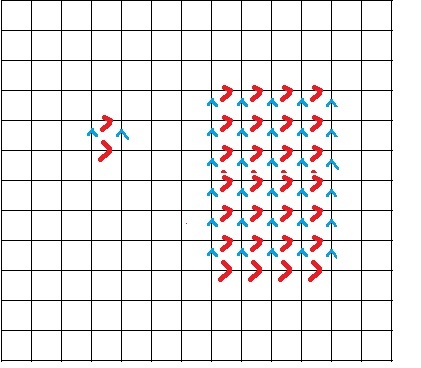 To have an inverse, your map has to be one-to-one, which means exactly what it sounds like: each person in X gets exactly one address in Y. The topic of this series of posts will be homeomorphisms of the torus: invertible, continuous maps from the donut to itself. Next time we’ll talk about matrices (ooh goody) and how they have to do with these homeomorphisms, and then eventually we’ll classify all homeomorphisms by what kind of matrix they are. Hi. I was searching for second-order knots and mathematics and your site came up (specifically the post about baklava) . I make art using knots. I also cook. I know a bit about calculus and linear algebra and but almost nothing about topology and algorithms and the rest. Your site might be an epiphany for me… food, the gateway through which all understanding arises! Thank you!